And the series shifts back to Queens, New York, with the Mets down 2-0. Tonight, at 8 PM EST on FOX, Noah “Thor” Syndergaard will take the mound, in a game that is set to be a do-or-die for the Amazin’s. Unfortunately, I will be missing the game as I will be attending services for my best friend, Thomas, who passed away in a Soccer accident on Monday. We attended multiple games together, specifically Cyclones and Mets games. We went to the same school all throughout our lives. Including the game that Matt Harvey hit a homerun in July. That was the last game we went to together, Like everyone else Thomas motivated me to continue blogging and the enjoyed reading my articles. I hope anyone reading this will have his family in your thoughts. When it comes to the World Series, though, the Mets bats need to wake up. I know that the Royals have been catching a lot of breaks lately, good pitching, and astonishing defense, but the Mets have some good atributes as well, that’s why they are in the Fall Classic, and that is why they are very capable of winning the series. Syndergaard has to have his best stuff today and it has to be effective. Having goods stuff with mediocre results in the game isn’t enough anymore. I hope I can write a happier piece tomorrow. The Royals defense is much stronger than the Cubs – Kyle Schwarber seems like a distant memory. The Royals have been consistently praised for their amazing defense, but now I think we truly know why. No throwing errors, fielding errors or bad arms. They have so much outfield speed which allows them to cover a lot of ground, which is important in parks like Kauffman Stadium and Citi Field. 2. The Royals bullpen has depth – The Mets have some quality arms down in their bullpen, including Jeryus Familia, Tyler Clippard, Hansel Robles and Addison Reed, but the Royals have a slightly better ‘pen, one that gets 1-2-3 stuff from Kelvin Herrera in the seventh, Wade Davis in the eighth, and Greg Holland in the ninth. 3. The Mets will put up a good fight, and won’t give up many runs- In 14 innings of Baseball, I saw why this will be a very good series. Both teams are young and full of energy. The Royals fans were in it all night and there wasn’t a seat left untaken all night long. Even though I’m a die-hard Mets fan, I’m happy that Edison Volquez got to pitch in the game with success, and my thoughts go out to his family. 4. Matt Harvey wasn’t sharp- Every time writers and bloggers talk about how Harvey needs to step up, he never does. I think we can now confidently say that if deGrom throws a good game tonight, he is the ace. I’m not saying Harvey is a bad pitcher, he’s a damn good one. But his command his overall approach to hitters isn’t ace-like. 5. This is going to be a long, fun, series. – I honestly cannot wait for the home games this weekend. I have tickets for Game 4, and will be proudly be wearing the Orange and Blue. deGrom goes tonight in what will be a very pivotal Game 2. Hopefully the win tonight and go back home with a series split in Kansas City. The Mets fifth trip to World Series begins tomorrow, at 8pm. 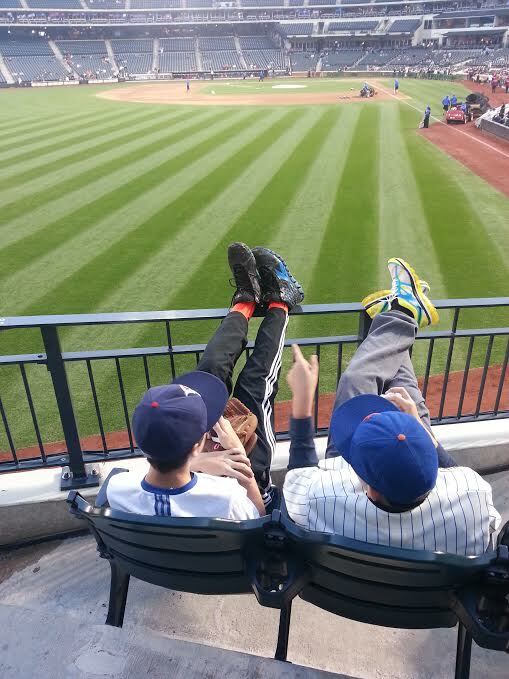 The average ticket price is currently sitting at 1,539, and 1,630 at Citi Field. Before this year, the highest ever average third party ticket price was around 1,200 dollars. This shows the excitement that has been building around this World Series, featuring young power arms (Mets) versus young speed (Royals). In other good news, Yoenis Cespedes, the Mets all-star addition that is probably the reason they are here, has told the media that he is feeling 100% after the cortisone shot that he took to relieve the pain from a injury that he sustained in the National League Championship Series. Unfortunately, official rosters have not been released, as it looks like we are waiting to see if Juan Uribe, who was dealing with some chest pain, can make the team. If not, Kirk Nieuwenhuis will probably be on the bench instead. While (reasonable) World Series tickets have sold out, there are a few rallies that will be held in New York City this weekend. If your looking for World Series gear and memorabilia, you can go to Steiner Sports, and get 25% off with code “METSPLUS”. While I don’t work for Steiner Sports, I think that packages should arrive in time for the home games if you order by tonight, October 26th. This is why I’m a fan. I would say that I’m at a loss for words, but I’m writing right now. My first memory of being a Mets fan was in 2006 during NLDS game 2. I remember hopping on the 7 express train at Queensboro Plaza, standing by the window on a crowded subway car with 75 Mets fans. I remember seeing Shea Stadium glowing in the distance, as we left the 111th street subway station. I then remember seeing the glowing Shea neons as we approached the station. I remember the electricity of the ramp as we descended upon Shea Stadium for Game 2 of the 2006 National League Division Series. My seven year old self loved that feeling, hearing the “Let’s Go Mets!” chants all night, but then we got eliminated. No problem, we thought. We would be back next year. We had the collapse of 2007, the heart brake of 2008 and the DL Ridden team of 2009 (Which is a The7Line original). We hit rock bottom that year and things never looked up until 2012. We had the no-hitter, the 20 win season, and fans started showing up to games. Then we had the All-Star Game in 2013 and we saw Citi Field shake a little bit for the first time. Unfortunately, 2013 and 2014 were not great years. We did not have quality bats, and our pitching still hadn’t hit it’s prime. 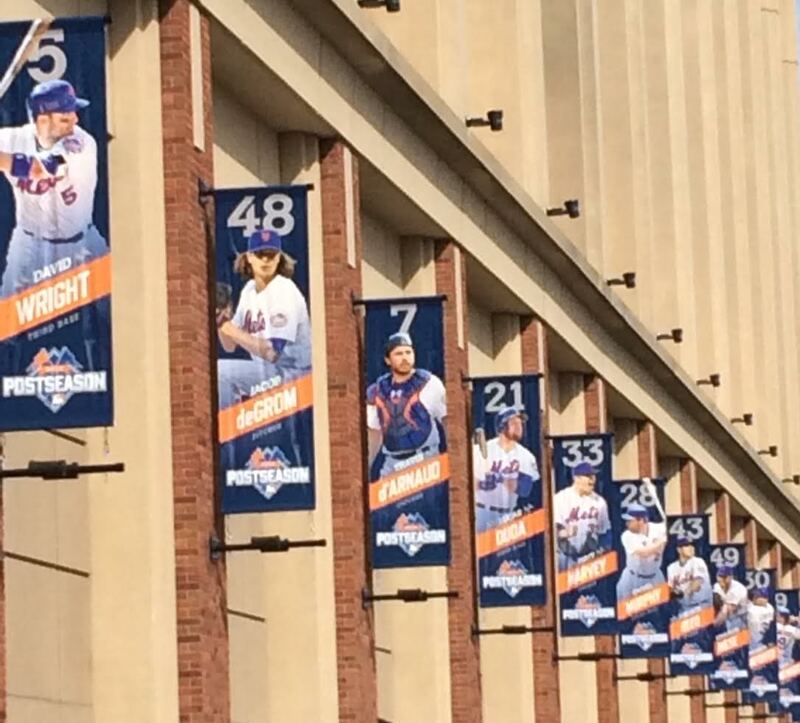 This year though, the Mets roster was perfect, and I couldn’t be prouder of our team. Here’s some reaction from some of my favorite bloggers that I’m proud to call my mentors. If you don’t recognize any of them, make sure to check out their blog. It’s Thursday morning. The sun is shining, the air is crisp, the leaves are colorful. It’s a typically quiet, unassuming, fairly routine start to a mid-October day. But you’re tired. Your head hurts from fatigue and joy all rolled into one. And you see the first person of the day wearing a Mets jacket, not your typical mid-October dress code. Then it hits you, again. The New York Mets – yes, the New York Mets – are the 2015 National League Champions. The Mets will begin the World Series starting Tuesday night away against the American League champion, who is still to be determined. What an incredible season! Four more wins, Mets fans! We can do this! And while I don’t have a cool story where I hoped on a flight to Chicago to catch a glimpse of the Mets winning the pennant, I will always remember last night. The fact that I can walk through my town and see people wear Mets gear with NL Champs in bold is something I never thought I would see. I hope there is more in stock for this magical team. Weirder things have happened, that’s baseball. Pepper MLB Blog has evolved into MetsPlus.com over the last 2 years. Now that we have completly phased out the Pepper brand, we invite you to join us at the new MetsPlus.